Throughout history, dogs have played an important role in Irish family and working life. This has made our four-legged friends integral to the country’s rich heritage. So in honour of St Patrick’s Day, RSPCA NSW has rounded up a list of some of Ireland’s most famous dog breeds. St Patrick’s Day may be associated with drinking, eating corned beef and cabbage, parades, shamrocks and wearing green, but there is another way you can celebrate all things Irish: by adopting your own Irish madra, or dog! Here are four fantastic Irish dog breeds who would love to find their way out of a shelter and into your home. Irish Setters are elegant-looking dogs, with longish, silky coats. They’re probably best known for their beautiful colour: their fur is rich chestnut or red. Irish Setters are also famously used as therapy dogs in hospitals and schools. This is because of their friendly, warm temperament. They can be a little mischievous though! 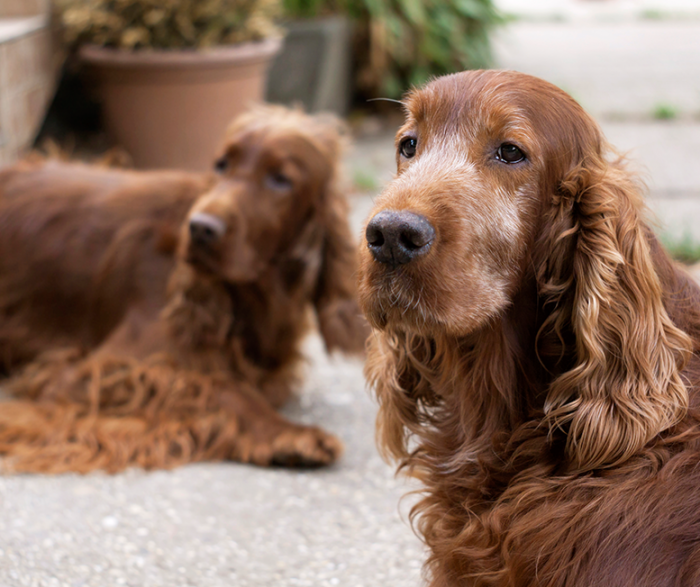 Irish Setters make for fantastic family pets and companion animals. However, as they are a hunting breed, some can be a little boisterous with cats or small children. As they’re very active, they need to be taken on long walks every day. These pooches also enjoy off-lead running, particularly if this means exploring big, open spaces. And as these dogs are very intelligent, they need lots of activities to keep them active and busy! These rugged, determined dogs are medium sized, and one of the oldest Terrier breeds. But what makes Irish Terriers stand out from other Terriers are their wiry, all-red coats, which is perfect for protecting them from the cold and the rain. These dogs are active, fearless and loyal, making them excellent watchdogs. They’re incredibly smart, so are well-suited to dog agility and puzzle solving activities. They also have a lot of energy, so need plenty of exercise to match. They respond well to consistent, reward-based training, but this must be given by a responsible human they respect (that’s you!). 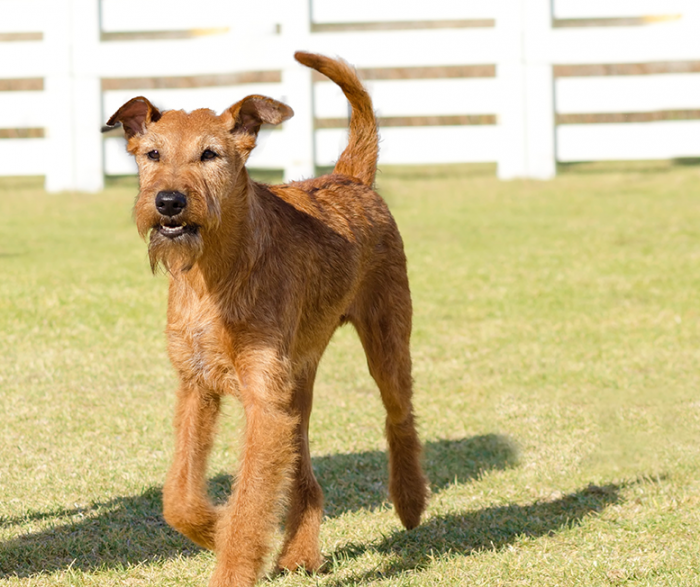 Irish Terriers also love children – in fact, they’re great with people generally, but can be quite dominant with other dogs. It’s therefore important to socialise these pooches early and as often as possible. 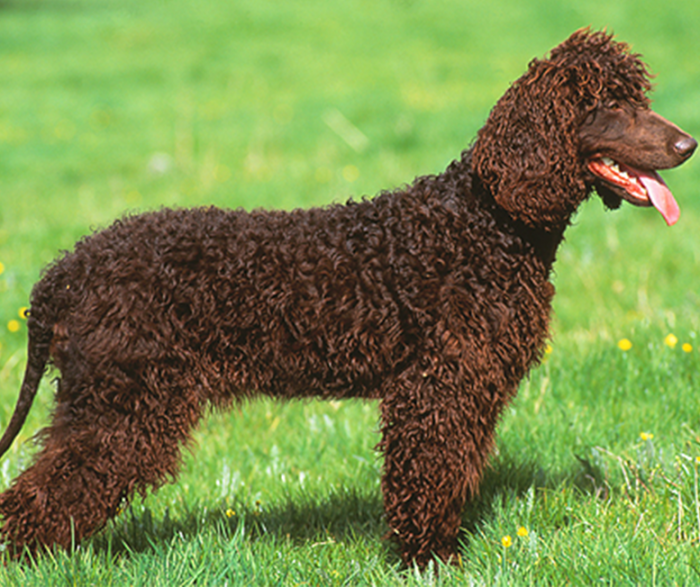 Irish Water Spaniels have dense curls and are liver or puce coloured, with a distinctive purple hue. As they shed their fur very little, some people who are allergic to dogs may find their reaction is less strong when they meet an Irish Water Spaniel. Irish Water Spaniels also have some distinguishing characteristics, and these features make this breed pretty rare! If you meet one, you’ll notice a beard-like growth at the back of his neck, sideburns and a topknot covering his eyes. But his most unusual feature is his tail, which is smooth, like a rat’s tail. Irish Water Spaniels are active and generally easy to train, as they have a strong sense of teamwork. They have a good sense of humour, are intelligent and are very curious. However, they can also be stubborn and reserved with strangers. 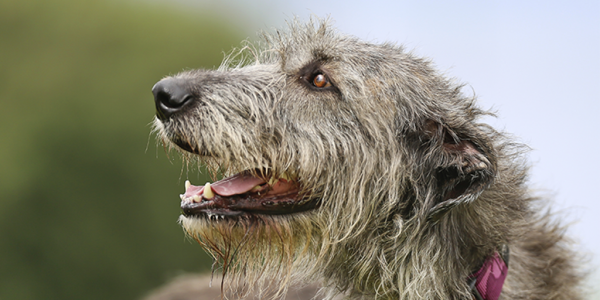 Irish Wolfhounds are a very old breed. It’s been suggested that they came to Ireland as early as 7000 BC! These dogs are muscular, rough coated, and were traditionally bred for guarding and for hunting wolves. You’ll know if you meet one because of their imposing height: they are one of the tallest dog breeds in the world! 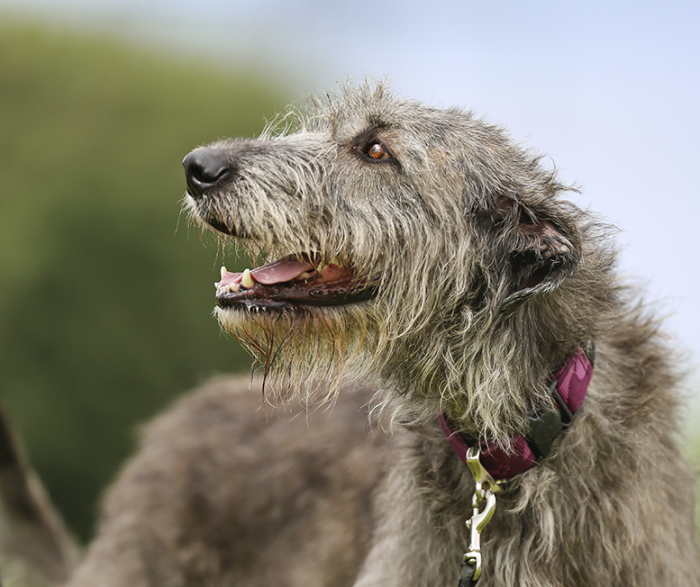 Despite their stature, Irish Wolfhounds are actually quite easy-going and reserved. They are generally very gentle with children and pretty easy to train. They also create a strong bond with their human family and can be very protective of them. They’re not so protective of their family’s house though, so don’t make good guard dogs. Although they’re not generally destructive in the house, they can be if they’re left alone for long stretches of time. So if you’re thinking of adopting an Irish Wolfhound, remember to stock up on those boredom busters! Ready to adopt your very own Irish dog? You can search through all the fantastic pooches in RSPCA NSW’s care, including Irish Setters, Irish Terriers, Irish Water Spaniels and Irish Wolfhounds on Adoptapet by clicking here.